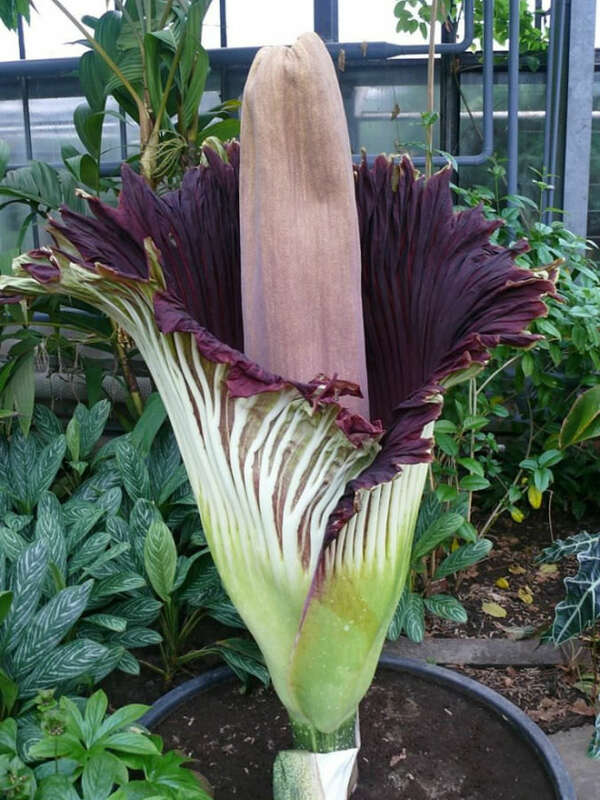 Amorphophallus titanum is a flowering plant with the largest unbranched inflorescence in the world. 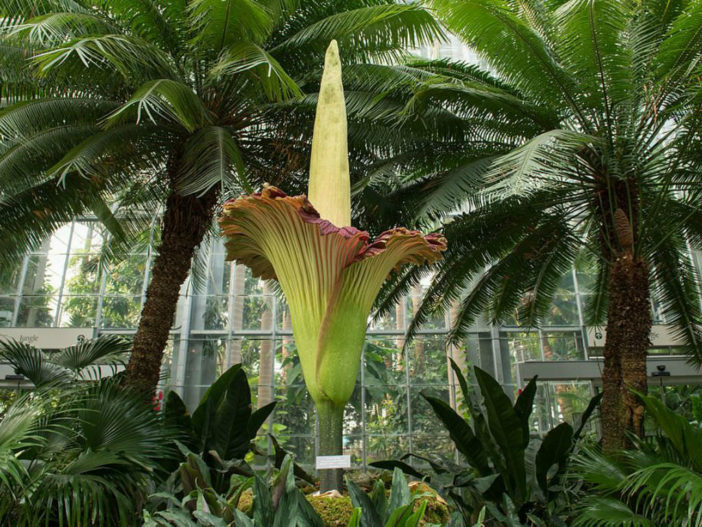 The inflorescence can reach over 10 feet (3 m) in height. 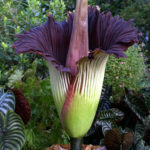 It consists of a fragrant spadix of flowers wrapped by a spathe, which looks like a large petal. 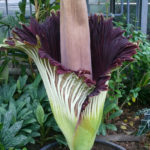 The spathe is a deep green on the outside and dark burgundy red on the inside, with a deeply furrowed texture. 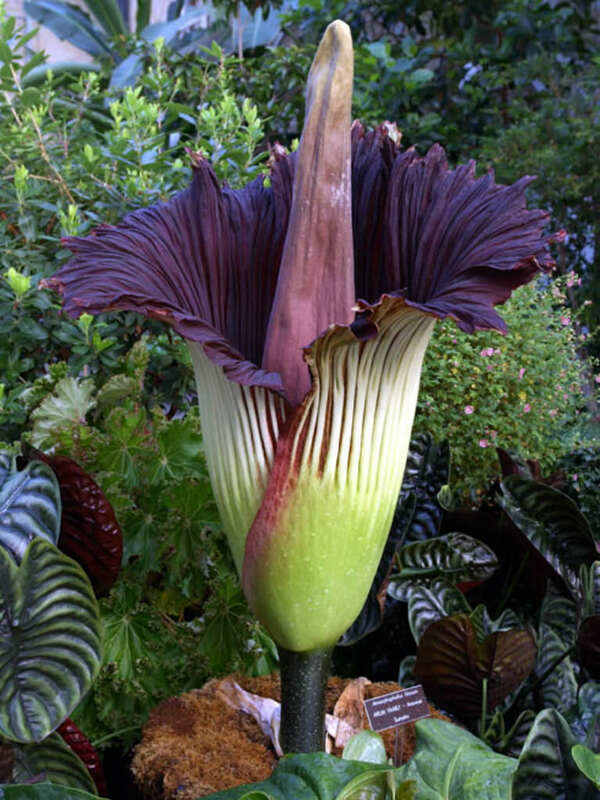 The spadix is hollow and resembles a large loaf of French bread. 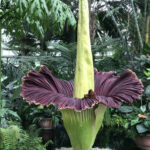 Near the bottom of the spadix, hidden from view inside the sheath of the spathe, the spadix bears 2 rings of small flowers. The upper ring bears the male flowers, the lower ring is spangled with bright red-orange carpels. Both male and female flowers grow in the same inflorescence. The female flowers open first, then a day or two following, the male flowers open. This usually prevents the flower from self-pollinating. After the flower dies back, a single leaf grows from the underground corm. The leaf grows on a somewhat green stalk that branches into 3 sections at the top, each containing many leaflets. The leaf structure can reach up to 20 feet (6.6 m) tall and and up to 16 feet (4.8 m) across. Each year, the old leaf dies and a new one grows in its place. 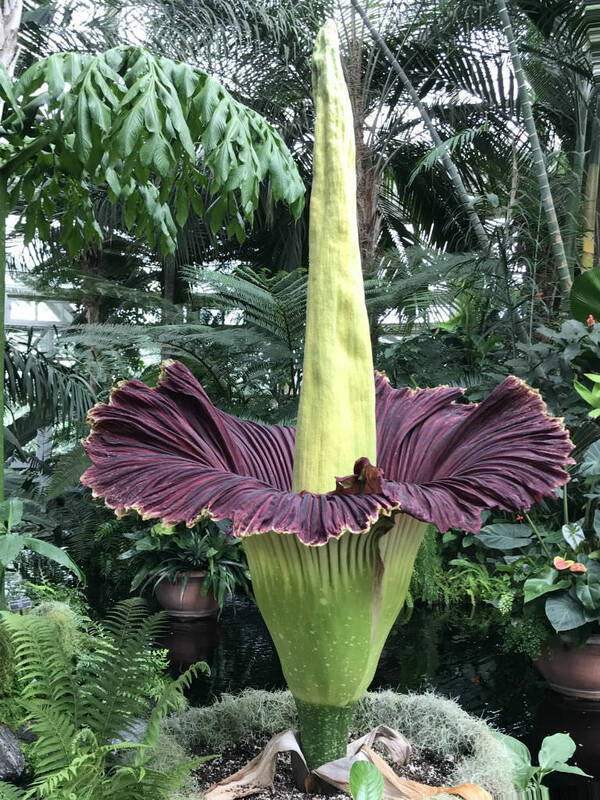 Many have said Titan Arum is one of the most difficult plants to grow in cultivation. However, it is not any more difficult than any other flowering plant. The difficulty comes in the consistent growing conditions for a period of 7 years or more. You must mimic its native environment of tropical Sumatra. For instance, every year, once the plant dies back the corm must be moved into a larger pot. If the corm is nicked or damaged, it can allow disease organisms to kill the plant. It is native solely to western Sumatra, and western Java where it grows in openings in rainforests on limestone hills.